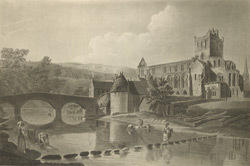 View of Jedburgh Abbey in Scotland by Charles Catton. The abbey was founded by the future King David I, in 1118. David brought a community of Augustinian monks from the Abbey of St Quentin in Beauvais, France, to establish a priory at Jedburgh. By 1147, thanks to substantial bequests from David, the Abbey had been elevated to a priory and was prospering. Strategically positioned on the boarder between Northumberland and Scotland the Abbey became very important. Charles Catton, the younger (1756 - 1819), travelled through England and Scotland making sketches and many of these were later engraved and printed. He exhibited many times at the Royal Academy and in 1804 emigrated to America.